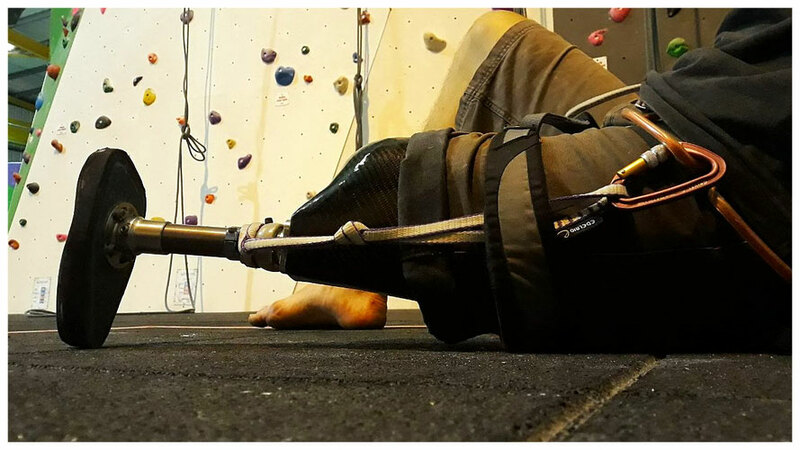 Easily done and essential: Securing your artificial limb when climbing. Who would have thought that lats week’s article - A simple introduction into paraclimbing as an above knee amputee - will be greeted by such a positive response. After the post went live on Wednesday, it took only minutes until the first reactions, additional questions, comments and thank you notes started coming in. Wow, that is great. I really wasn’t expecting that. …as many of you know I normally climb with a short set-up; i.e. I use my day to day socket, replace my Genium with the ADK climbing foot and that’s it (see picture). For some time I have been struggling with a good fit for my socket. Volume fluctuations in my residual limb made it close to impossible to have a snug fit of the socket throughout the day. While I learned to compensate this in my day to day life - it’s rather easy with the often very receptive and predictable movements in my day to day life - things are much harder climbing. There is no regular and predicable movement of the leg. Each move is different, every step demands a different way of loading the leg with weight, some moves are almost in slow motion, others are very dynamic and abrupt. Chances are high that sooner or later the socket will come loose and the leg will come off. Which is bad enough on flat ground and worse when in vertical terrain. In addition your foot can get stuck underneath a hold when you are moving up. Especially with dynamic moves, this is a real possibility. And one that is not just annoying, but potentially very dangerous. I once had a near miss when climbing outdoors. Great weather, a nice route, big holds that invited you to try out more dynamic moves. I aimed for a big jug, bent my knee a bit, catapulted myself up and…got stuck with my climbing foot under another big hold I didn’t notice, bringing me to an instant halt. The stop itself wasn’t the dangerous part. But the force from the movement upwards combined with my foot being stuck underneath a hold was enough to pull me completely out of my socket. I was lucky. As I was wearing long trousers the artificial limb could’t go far. But when wearing shorts and depending on how tight you wear your leg loops from your harness, you might see your prosthesis tumbling down the crag. You might be lucky, it might only crash into the rocks and break. Definitely annoying and potentially very expensive to replace. But things might be worse. It might hit your belayer, who will let go of the rope which might have fatal consequences. A nice day at the crack can quickly turn into a tragedy. So make sure you secure your prosthesis to your harness. This can easily be done; a simple nylon or dyneema sling and a carabiner is all you need. And they cost you less than a tenner. Securely attach the sling to the limb, run it underneath the strap from your leg loop and clip the carabiner into the gear loops of your harness. Done. This is not to scare you. This is to make you aware of the potential danger. And to show you an easy way to eliminate this risk and have an enjoyable and safe climbing experience.